Spinzilla was ages ago, or so it seems now, especially since a good chunk of the people in my yarn and fiber network went to Rhinebeck1 this past weekend, and like Spinzilla, I hope to one day experience Rhinebeck. Since this was my first Spinzilla, I set really attainable goals for myself: I just wanted to spin every day. Upon hearing about the Monster Mile Club, I also quietly decided that I wanted to spin a mile (1760 yards). 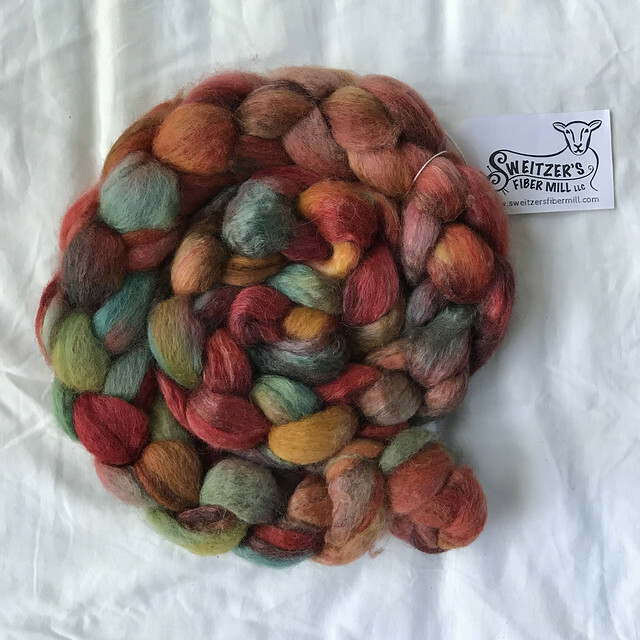 Tallying your yards spun is a bit different for Spinzilla. You count the length of all your plies in addition to the length of the yarn, so you count the spinning of the singles and the plying of the yarn, so you calculate total yards spun as (length of yarn x plies in yarn) + length of yarn. For example, let’s say you have 10 yards of a finished 3 ply yarn. 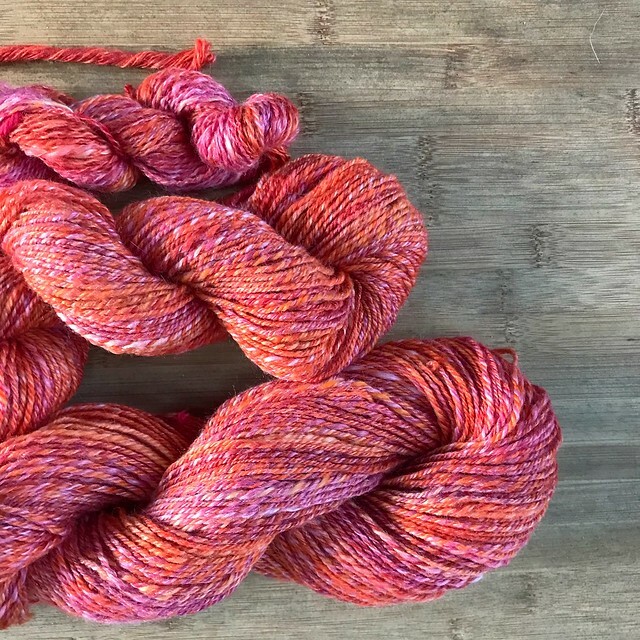 For Spinzilla, you count 30 yards (10 yards for each ply) plus the 10 yards for making the final yarn, for a total of 40 yards spun. I know that calculation can be confusing, and I probably haven’t helped much to allay that – suffice to say that I spun a total of 5,040 yards, blowing my goal to spin 1760 yards out of the water! Here’s a family portrait of my 2.89 miles spun. I’ll get to the individual spins in a moment. 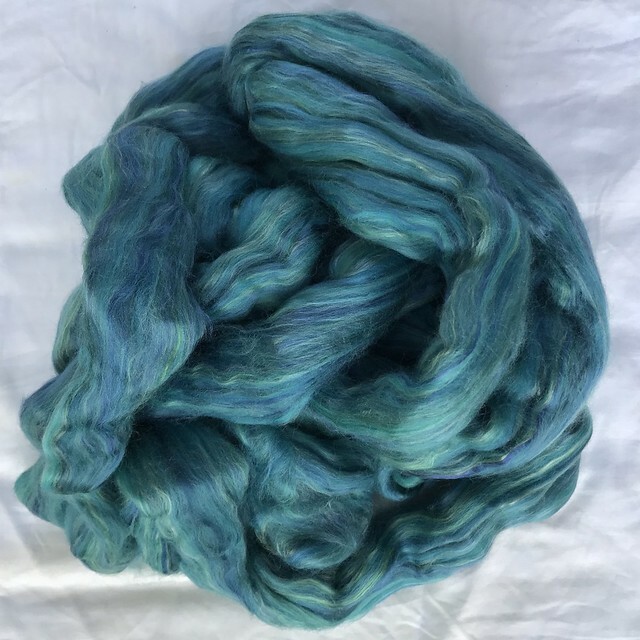 To prepare for Spinzilla, I spun nearly every day and loaded up my stash with far too many braids of fiber; I think I somehow thought my pace would increase magically but I also used it as a convenient excuse to indulge. On day one I started out with this lovely braid, my favorite out of everything I got at Shenandoah Fiber Festival. I saved it just for Spinzilla, too. I decided to spin this 4 oz bump2 as a fractal 3 ply, so I divided the braid into 3 lengths. The first length, I spun. The second length, I divided into 3 strips and spun. The third length I divided into as many strips as I could manage, about 9, and spun. 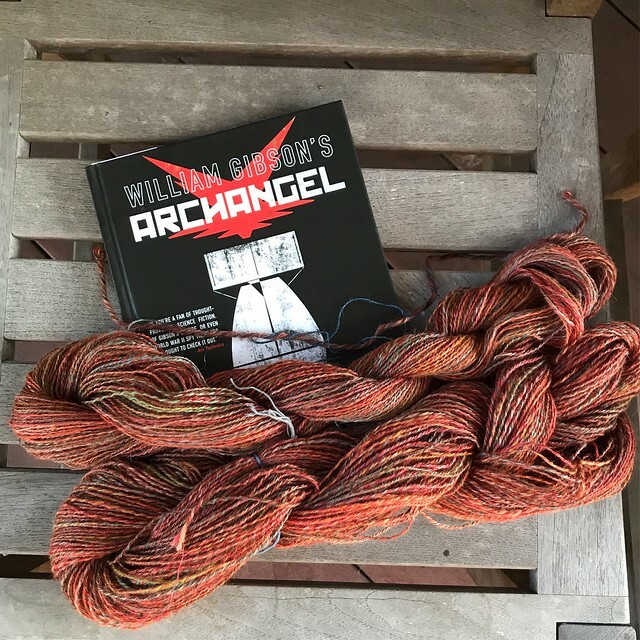 Then on day two I ignored my new copy of Archangel and plied them together and got this: 202 yards of 3 ply yarn, 174 yards of 2 ply yarns, and about 12 yards of singles. 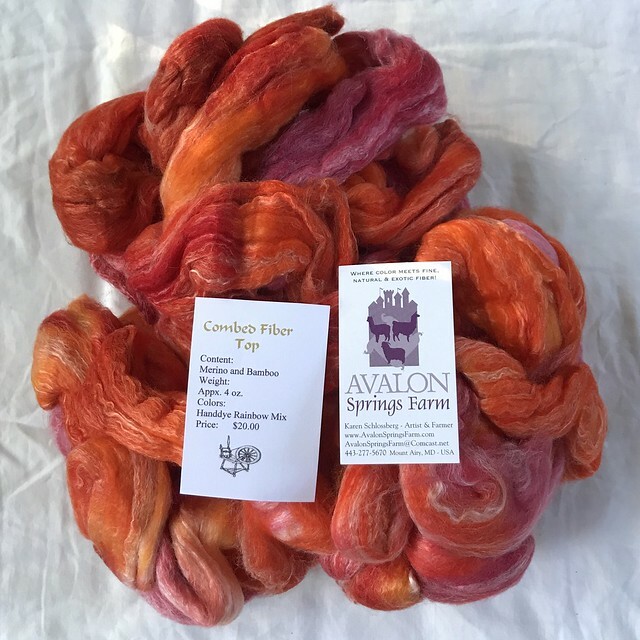 On day 2 I also started spinning 4 ounces of top (40% merino, 40% bamboo, 20% tussah silk) I got from the Fiberists at Shenandoah Valley Fiber Festival. I practiced my long draw on the singles (I usually use short forward draw), with predictably uneven results, which was a bit frustrating even though I got better the more I did it. By the end of the bobbin, it was pretty even, but I used up a lot of my patience on drafting technique. On day three I chain plied the singles, so I’d use them all up, but I did it quite badly; I started losing my patience, went too fast, and ended up with a yarn that has small, loose beehives through it a bit unevenly. After the frustration of chain plying gone wrong, I took a nice long break and decided I’d spin this 8 ounce bag of merino & bamboo. Once again, I wanted to try a fractal spin, so I divided the fiber into three equal parts. I spun the first part as it was in the roving, without having to divide the roving lengthwise. I divided the next part of the roving into 3 lengths, and the final part of the roving into as many small strips as possible. 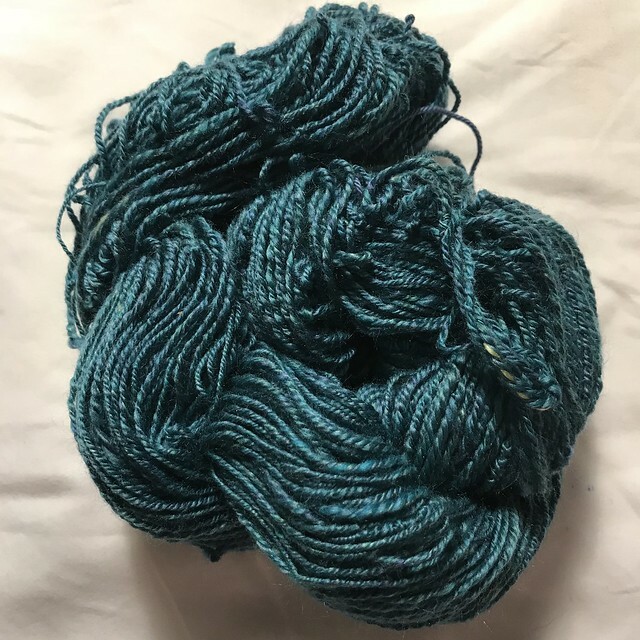 As I spun, I discovered why the seller may have given me 8 ounces for the price of 4; parts of both braids were stuck together as though glued or felted or possibly melted (does bamboo fiber melt?). I powered through it on days three, four, and five, finishing on day five (Saturday) by plying. I ended up with 2 skeins of 3 ply yarn, one at 180 yards and the other at 256 yards, 56 yards of 2 ply yarn, and 10 yards of singles. By this point on Saturday afternoon, I was really sick of spinning. 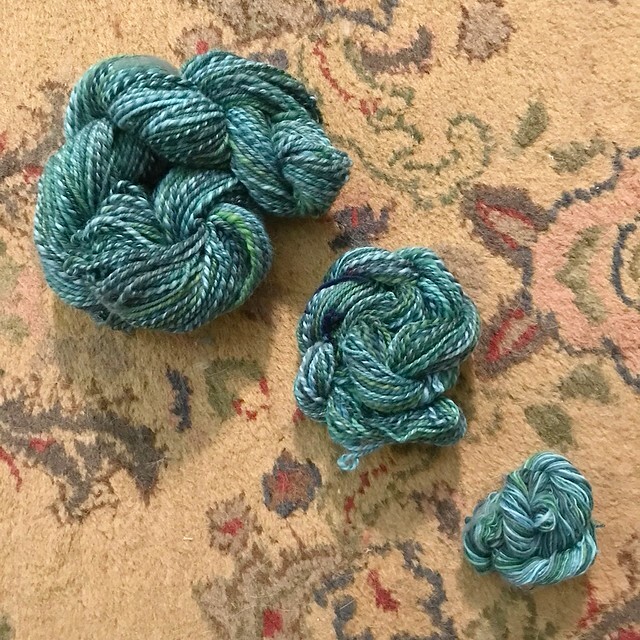 My hip flexors and lower back hurt from sitting too much – I should have thrown some spindle spinning in – and I had listened to all the podcasts and NPR I could handle. I was also really tired of looking at orange and pink and red. For my final spin, I chose the soothing colors of this superfine merino roving from Three Waters Farm and tuned in to Indie 88 out of Toronto, which was doing a countdown of listener favorite songs. I decided to fractal spin this bump as well, dividing it lengthwise into 3 parts and then further dividing it similarly to the other fractal spins I did. I ended up with 138 yards of 3 ply, 44 yards of 2 ply, and 56 yards of singles at about 9pm on the last day. 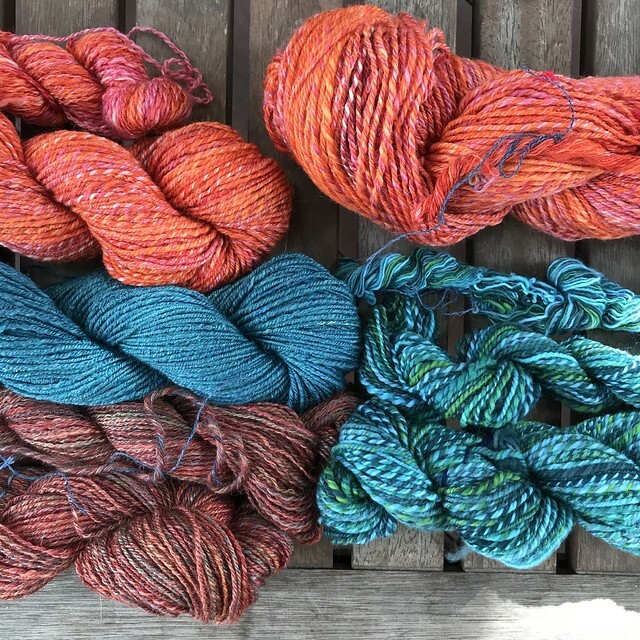 Throughout Spinzilla, I checked in with my team every day on Ravelry, Team Spin Off, sponsored (I think) by Interweave Press and Spin Off magazine, to which I should subscribe. It was a great group, very encouraging, and one of my favorite parts of the whole thing was seeing what other people were spinning. I blew my goals out of the water. Not only did I spin every day, but that’s what I spent most of my days doing. I also spun close to 3 miles, more than double my goal. I tried two things I hadn’t done (much) before: fractal spinning and long draw, and I got better at both. It’s been a while since I lost my patience with myself and something I was doing like I did the Saturday of Spinzilla; I haven’t felt like that since just before deciding to back off on roller derby. 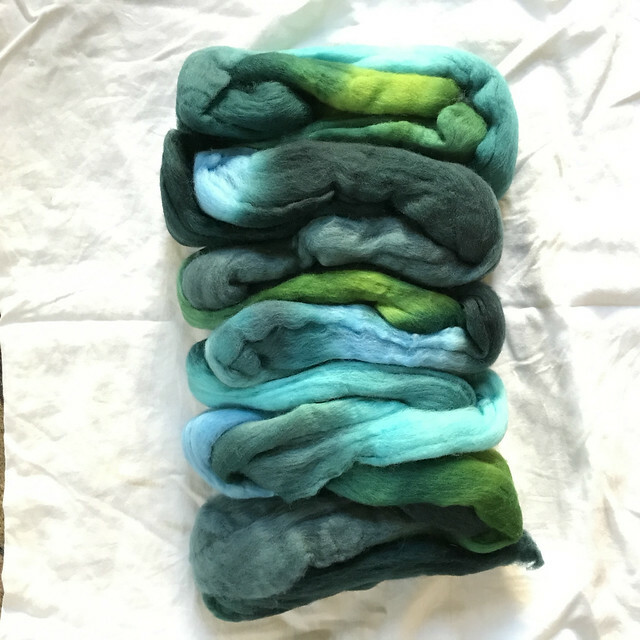 I’m not going to back off on spinning (or fiber art in general) the way I did with derby; I just need some time to collect myself, which is okay and a normal part of how I expend time and energy on things. Adjusting my thoughts on Spinzilla has also led me to reconsider roller derby; I may look into going to a practice to see how it feels. The league and my former home team have changed so much since I stopped playing in 2015, Going back could also mean going back at 50% effort instead of my usual 250% effort. We’ll see. 1. New York Sheep & Wool Festival in Rhinebeck, NY. 2. An unspecified mix of BFL, llama, and seacell. Thank you, Shirley! I’m not sure what I’m going to use all of it to make, but I do need to make myself a new winter hat. I was thinking about listing some of this & other handspun in my stash in my etsy store, but haven’t decided quite yet. Next year could be my year too! Like you said, one never knows and it’s not *too* far from where my brother lives in VT, so I could make it part of a bigger trip. I tried rolling around in it like Scrooge McDuck, but I really need more for than to be comfortable. Next Year! I’m not a spinner (although it’s something I’ve always wanted to try), so I don’t understand all the terminology, but somehow it all makes sense! What gorgeous colours! Thanks for sharing. Thanks for reading! The colors are one of the reasons I enjoy spinning; it’s a way to spend more time with them, if that makes sense. That blue is like water from Havasu Falls in the Grand Canyon! So beautiful, I would have a hard time spinning it just to look at that gorgeous color unspun.